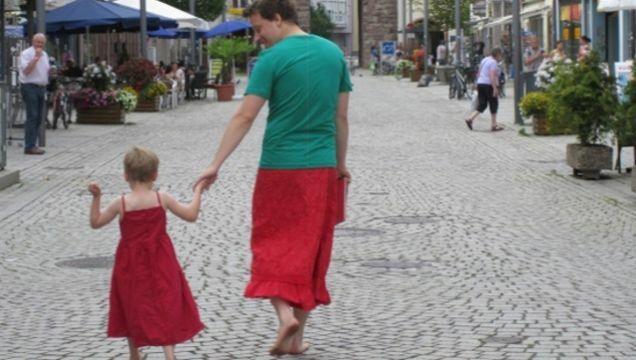 "My five year old son likes to wear dresses," says German dad Nils Pickert. Back when he lived in West Berlin, it was certainly a conversation-starter, but not much more than that. Now, however, Pickert and his son live in a "very traditional" South German village where his son's predilection for dresses is the talk of the town. "I didn't want to talk my son into not wearing dresses and skirts," Pickert tells the German feminist magazine EMMA. "He didn't make friends in doing that in Berlin already and after a lot of contemplation I had only one option left: To broaden my shoulders for my little buddy and dress in a skirt myself." 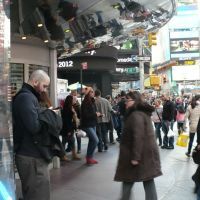 At first, Pickert's son was reluctant to wear a dress in public, fearing he would be laughed at, particularly by other kids at his preschool. But that all changed one "skirt and dress day" when he and his dad made a resident of the town stare so hard she slammed into street light face first. "My son was roaring with laughter," says Pickert. "And the next day he fished out a dress from the depth of his wardrobe. At first only for the weekend. Later also for nursery-school." And what's the little guy doing by now? He's painting his fingernails. He thinks it looks pretty on my nails, too. He's simply smiling, when other boys ( and it's nearly always boys) want to make fun of him and says: "You only don't dare to wear skirts and dresses because your dads don't dare to either." That's how broad his own shoulders have become by now. And all thanks to daddy in a skirt.